...and another thing, you go down there and end up getting beer dumped on your head and get into a fight with your kids or whatever... then parking, etc... it just ain't worth it to watch an anti-American organization. To me, it would be like paying $11 to go to a Bernie rally. Instead of beer, lots of weed, lot and lots of weed. NFL stadium attendance continues to suffer as the backlash from players protesting the National Anthem extends into week 15. 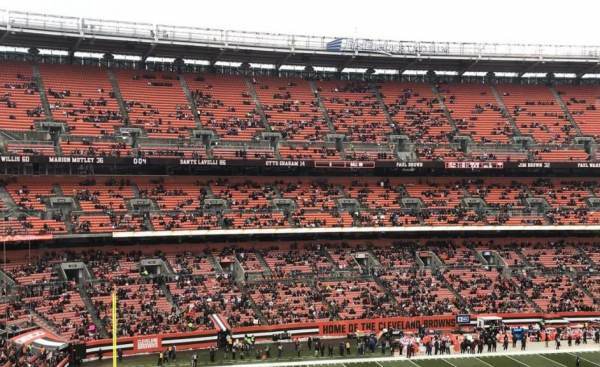 Fans from across the league are sharing photos showing stadiums plagued by empty seats this Sunday. The NFL has been on the losing end of the culture war since players from around the league began kneeling during the National Anthem. Started by former San Francisco 49ers quarterback Colin Kaepernick, the ill-placed form of protest has led to failing stadium attendance, lackluster ratings and the scorn of the most powerful in the world — President Donald Trump. Tickets for the game at Mercedes-Benz Stadium start at $1,475 apiece on StubHub — at the time of writing, on Monday morning — and that absurd amount of money is for a seat in the upper corner of the stadium. As for Vivid Seats, tickets start at $1,366. The most expensive tickets on StubHub cost $5,234 apiece, those are located seven rows back, near the 30-yard line. As for VS, the priciest ones are $8,500. The average selling price on TicketIQ for last year’s contest was $610. The first College Football Playoff title game in January 2015, which featured Ohio State vs. Oregon, had an average sale price of $858. This year’s title game had an average asking price of $3,418 and a maximum asking price of more than more than $27,000 hours before kickoff. What's the big deal? This is COLLEGE football, not the NFL....? People haven't lost interest in Football, so what's the NFL doing that's driving away fans? Duh. Oh, it was a great second half game, I listened on the radio, what a heck of a finish. How often does your QB get sacked for a 16yd loss, and the next play toss a perfect pass almost 50 yards into the end zone to win in OT?